How do you make a personal story about confronting a husband and wife’s mid-life crises into a box office hit? 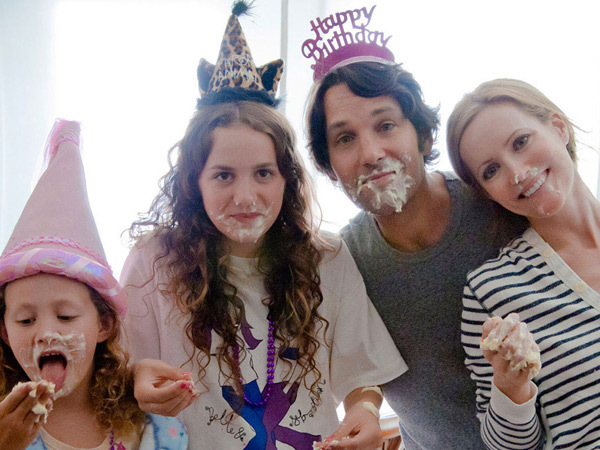 Judd Apatow’s This is 40 is a fascinating mix of genres, emotions and style. He’s fashioned a comedy-drama, which includes bathroom jokes, satire about America’s collapsing retail economy, the difficulty of being a rock promoter and the horror of confronting your family—and especially your father—-in a film, which stars his wife, Leslie Mann and their children, Maude and Iris. Much like life, Apatow’s range in this film is vast and not always true. But his effort is worth applauding both for its hubris and its laugh-out-loud comic scenes. Let’s not forget: Judd Apatow is Hollywood’s leading comedy filmmaker. Over the twenty years, he’s been involved as a producer in making millions laugh to Jim Carrey in The Cable Guy, Will Ferrell in Anchorman, Jason Segel and Russell Brand in Forgetting Sarah Marshall, Jack Black in Year One, John C. Reilly in Walk Hard, Jonah Hill and Michael Cera in Superbad, Seth Rogen in Pineapple Express and Kristen Wig and Maya Rudolph in Bridesmaids. But there’s another side to Apatow—a personal one. When Apatow has worked as a writer-producer and often director, his work has come off well critically but not necessarily with the public. Freaks and Geeks, the cult TV show, which launched Seth Rogen, Jason Segel, James Franco and Ben Foster never scored well in Nielsen ratings. His Adam Sandler-starring Funny People tanked at the box office despite critical acclaim. (I thought it was great). Apatow did fabulously well critically and publically with Knocked Up, his hilarious tale of an accidental pregnancy that turns out well. That film starred Seth Rogen and, in the titular role, Katherine Heigl as the pregnant sister of Leslie Mann. The relationship between the sisters was incisively explored by Apatow as was the volatile friendship of the two “husbands,” Rogen and Paul Rudd as Leslie Mann’s mate. (Rogen and Rudd’s trip to Vegas is a highlight of the film). Now, Rudd and Mann take centre stage for this unique sequel to Apatow’s biggest hit. He’s an unsuccessful promoter, dedicated to reviving 1980s rock musicians like Graham Parker, whose best-due date was decades ago. She runs a fashion shop, which would be turning a profit if one of the two employees would stop stealing. Worse, they’re not sure if they love each other anymore. They’re plagued by parenting problems with their two girls and dealing with their difficult relationships with their fathers. In short, they are having mid-life crises writ large. Paul Rudd has the most difficult part in This is 40. He has to play Judd Apatow—sort of. Watching the fit Mr. Rudd fishing out a water logged cupcake to eat is odd. You know it might have happened to Apatow but it certainly would never occur to Rudd. But Rudd is utterly convincing as someone desperately trying to reinvent himself. After much prodding, he does deal with his manipulative father (Albert Brooks) and finally confronts Ms. Mann, his “wife.” Although he doesn’t get all the laughs, Rudd is solid and charming in a tough role. Leslie Mann is also fine, playing the difficult role of herself—sort of. Mann is an edgy actor, who never relies on the easy way out. She toes a difficult line, between being absolutely “honest,” and playing the script from Apatow’s point-of-view. This is 40 won’t be another Apatow mega-hit. It’s unwieldy and not well structured. But is it worth seeing? Absolutely!